After almost a year playing a campaign with my mercenaries (Mariemburg), my group has decided to re-start the campaign with new players and new warband. And I have prepared a Witchhunter Warband to play this new campaign. To build my new Warband I got the original Mordheim Witchhunter box. However, some models are really awful and therefore, I decided to find some substitutes. I replaced the old flagelants by flagelants from the 6th Warhammer Edition (if I’m right). I don’t like the new plastic ones, because they looks like people from Catachan….and flagelants are poor people with mental disorders. They cannot have that kind of muscles!!!. I also replaced the Warrior Priest by a fantastic model from Avatar of War. Cheap and high quality!. 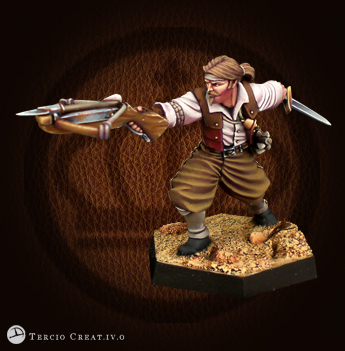 And finally, I fell in love with some Tercio Creativo’s models, a Spanish brand that have created a XVI century game with some fantasy details. The models fit perfectly with Mordheim!. 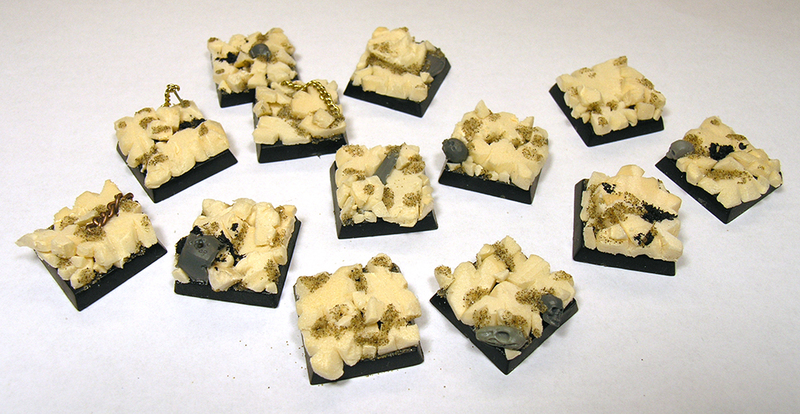 On the other hand, I wanted to explain how I built the bases. You only need foam and some pieces from warhammer or somewhere else. 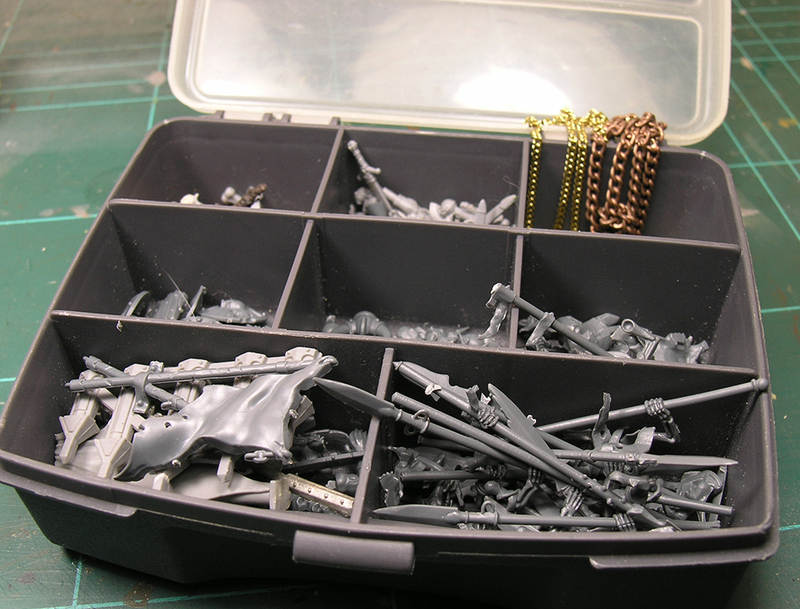 We can use these traces to add some details to our bases: skulls, chains, weapons, etc. 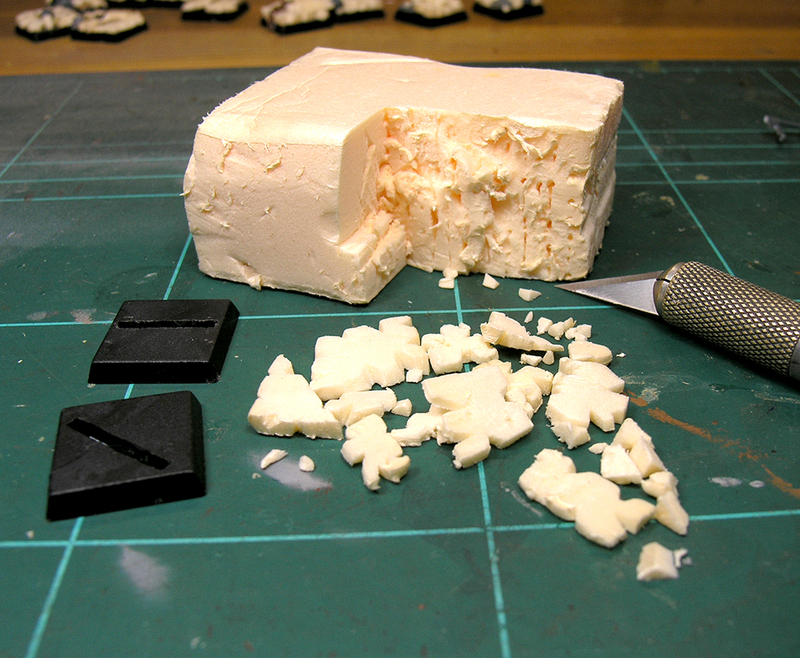 Anything is OK.
To create a ruin looking we only need to cut small pieces of foam. Try to create variety: big, small, thin, thick, a triangle, a square and so forth. Then, we have to “sculpt” some texture. This is very easy. We only need to remove small “triangles” from the borders of these pieces with a knife. We don’t need to remove the whole “triangle” from the piece. Take a look at the picture. Some “triangles” represent notches, while others have been completly removed. Ah, don’t throw away the small triangles you have removed!, you can use later to fill gaps. Now, we only need to put together all this pieces plus some weapons, skulls, or other details we want. You HAVE to use white glue to fix the foam. If you use other glue, the foam can be degraded. Finally, once is dry, you can fill the gaps with the remaining small triangles and you can also add some sand to create a better texture. Now, you only need to paint it!. For example, I have use a couple of grey tones. But you can use other combinations. And take a look at the grass. The samll grass “dots” are really stricking!. You should play with this contrasts.